It's interesting to see how long various watches were produced. Some were only made for a single year, others two or three. A long run would be four years before being discontinued. And there are quite a few that were made for 5 or more years. One of the surprisingly long-run models is the 1965 Accumatic A-506. It was produced through 1972. Initially the model came with a silver textured dial or a black dial on either a strap or bracelet. In 1968 the style of bracelet was changed. 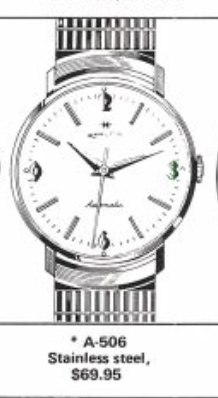 It's not clear from the catalogs if the silver dial was also changed - but it appears to have lost it's "texture". 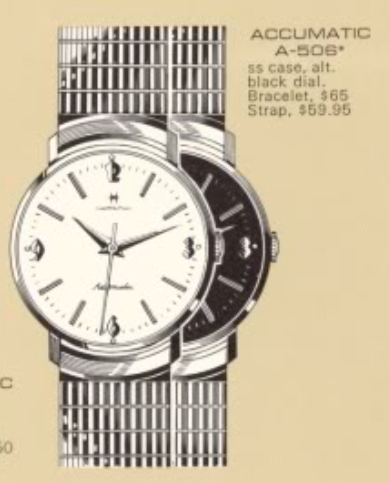 By 1972, the black dial was discontinued, as was the option for a strap. Inside the one-piece stainless steel case is a 17 jewel ETA-based 689A automatic movement. The movement may have been changed in the 1970's models to a Hamilton 63 or 63A, which is based on the same ETA 2451 grade. My A-506 project watch arrived dead on arrival (DOA) and not running. You never know what the cause of that could be... maybe it's just dirty, maybe something is broken, maybe the hands are just touching each other. The crystal was also very scratched up so it's hard to tell what sort of condition the dial is in. The crystal has to be removed in order to get to the movement and with the crystal out of the way, you can see the dial is actually in very nice shape. It has as slight bend at the 2, 6 and 10 positions... I've never seen that before and I'm not sure what that's about. It could be that the movement rattled previously and a prior watch maker did that to "fill up space" and tighten it up. Inspection of the movement doesn't show any obvious reasons for not running... so that's a good sign that it's not a broken balance. The textured dial looks almost like cloth. Other than the three bend sections (one is visible under the 6) and a small scratch below the 3, the dial looks otherwise "new". Two screws hold the rotor assembly on the movement. However, one of them is missing. If that fell into the works, it would definitely stop the watch from running. With the rotor out of the way, I found the missing screw but it wasn't in an area that would stop the watch. As I take it apart I will inspect each wheel to see if anything is bent or broken. Everything seemed to be okay so I suspect it was not running because it was just dirty. A thorough cleaning should correct that and now all the freshly cleaned parts are dried and ready for reassembly. As hoped, all the watch appears to have needed is a trip to the spa. The reassembled movement is now purring like a kitten, as evidenced by the blurred balance wheel. Now it's off to the timer to see how it's running. This movement's regulator has a "hair trigger" and even the slightest of adjustments has a large effect. But eventually I got the timing to dial in around 3 seconds fast per day. A new crystal will be a great improvement to the aesthetics of the watch. Adding a 30.6mm PHD crystal will make the outside of the watch as nice as then inside. And here's the finished project - what an improvement, huh? Based on the bracelet and dial, I'd say this is a 1965 model. 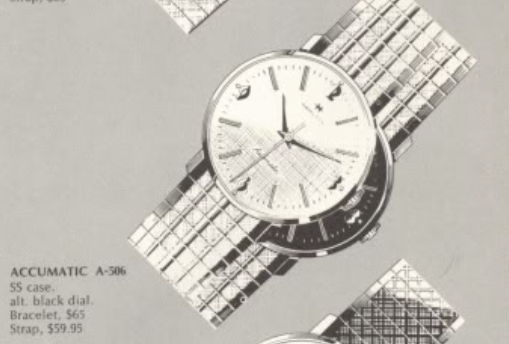 The 1966 catalog has the same bracelet but doesn't show the same textured dial. However I don't know for sure that the 1966-67 model did not have the textured finish so this could be a 1965-67 model. Regardless - it's ready for another 40 years of wrist time... assuming it's serviced every few years in between. I scored an alternate black-dialed version of the A-506. The black dial is smooth and not textured like the gray dial. The after-shot is a nice improvement over what I started with. A new crystal and proper-fitting crown made a big difference. Dan: I was 12 years old when I received this watch as a Christmas present, and it hasn't run in many years. It will be like turning back the clock to have it back on my wrist this Christmas. I really appreciate your efforts. I have one that is not running. Graduation gift from 1968. Do you repair other ones or just your own? I have a silver A-506 with no stem (2 pieces male and female??) and no crown, could you help me find the correct ones, even a subtitute to make my watch run again?? ?